NECKBAND AND AUTO-RETRACTABLE EARBUDS: New sports around-the-neck style and retractable earbuds design and flexible and durable silicone for more comfortable and convenient experience. Jog switch make volume control more smooth. And it\'s super-lightweight, only 1.5 oz. 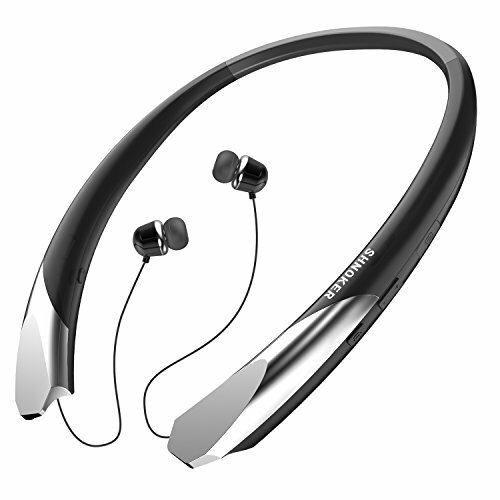 PREMIUM SOUND: Equipped with 6G CVC noise cancelling function and built-in hands free HD microphone to help enjoy Hi-Fi Stereo Music Sound and clear calls for running and workout. NEW BLUETOOTH V4.1: New bluetooth version 4.1, with fast pairing speed and stable connection. Connectivity distance can cover 10 meters (33 feet).Supports two devices connected in sync and automatically reconnects after being paired successfully for the first time. WIDE COMPATIBILITY: Supports IOS/ Android/ Windows cellphones (including iphone, Samsung, SONY, LG and so on)and pad, notebook, computer and other bluetooth devices. Latest Bluetooth Technology provides noise cancellation with clear hands-free calls, & doubles as a bumping pair of headphones as needed with premium HD sound quality! Great for workouts, jogging, etc. Hi-tech, futuristic design..beam me up scotty!